New Colors! More Pigs! More Scoring! More Fun! Pass the Pigs Party Ed. Family Game Dice Travel (8) Pigs. Now up to 4 players can play ALL at once - WITH HOT NEW COLORED PIGS! Four pairs of Pigs are included. It's Pass The Pigs and MORE! More pigs, more points and more fun! Go hog wild with the pig-tastic game, Pass the Pigs. 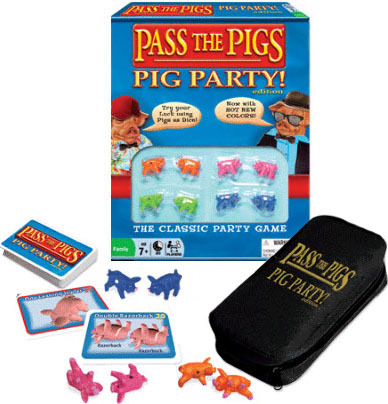 Pass the Pigs is the classic party game where players try their luck using pigs as dice! Roll the two comical pigs as many times as you dare on your turn to rack up points. But if you press you luck and roll a "Pig Out" or an "Oinker!" you'll lose them all. First player to score 100 points wins! Pass the Pigs is the sizzlin' fun, shakin' bacon game!